Last week we discussed what to eat around training. This week, again in partnership with Herbalife Nutrition, we’re diving into hydration and going beyond the age old “drink 8 glasses of water a day” tip to what every athlete should be doing for peak performance and to keep their bodies healthy and thriving before and after working out. We’ve all heard it before, we know that we need to drink somewhere around 8-9 glasses of water a day for our general wellness (our bodies are made up of 60-70% water so dehydration can be extremely detrimental to normal body processes from digestion to even the way your brain functions) but for most of us, that’s easier said than done. Good news – it doesn’t have to be just plain old boring water! Other liquids count towards that daily goal and research has even debunked the former thought that caffeinated beverages don’t count or, even worse, have an inverse effect on hydration – it’s been proven to simply just not be true. That said, consuming all your liquids in the form of blended coffee drinks isn’t the best idea either (hello, extra calories!) but a cup or two of plain coffee or tea can definitely count towards your daily hydration goals. While I definitely drink my fair share of plain water (with a squeeze of lemon juice and tablespoon or so of good quality apple cider vinegar – my favorite! ), seltzer, especially flavored seltzers, are my go-to when water just sounds too boring. I find the bubbles in seltzer to be not only more interesting than regular water but more filling too so it’s not only a good hydration option but also a little trick to control your appetite. Another tip for general hydration is to eat your water! Certain foods (cucumbers, watermelon, celery, tomatoes, peppers to name a few) are more than 90% water themselves and can be used as a hydration source. So, when you just can’t even deal with downing another glass of liquid, try munching on some celery sticks or cucumbers instead. For athletes, and not just elite athletes, we’re talking about anyone who works out, hydration is serious business. Dehydration of just 2% can impact performance so it’s important to not only be hydrated adequately going into your workout but also to maintain hydration throughout your workout, especially if it lasts 1 hour or longer as we discussed last week with what to eat during your workout. An easy way to see if you’ve become dehydrated from working out is to weigh yourself before and after a workout, especially when it’s hot outside. For every pound lost, you should be rehydrating with 16-24 ounces of liquids. 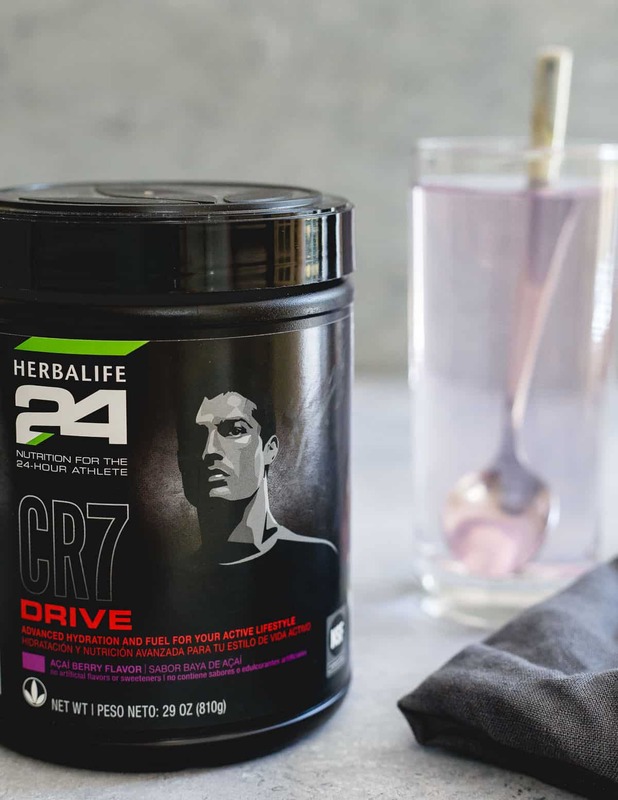 Sports drinks and coconut water are both great options I use often as well as Herbalife24 acai berry flavored CR7 Drive – a blend of electrolytes, carbohydrates and vitamins. My recent favorite has been adding a scoop to a glass of plain coconut water for a double punch of hydration. When I know my gym sessions will be longer than an hour or particularly intense, I actually bring that to the gym in my shaker bottle as my intra-workout drink/nutrition. If I don’t drink it during my workout, I’ve also been making post-workout smoothies with it. Combined with protein and some added carbohydrates, it’s a great option for what to eat after your workout. In this hydrating berry green smoothie, I use frozen strawberries (carbs), plain Greek yogurt (protein), a generous handful of baby kale (any baby green will work though), coconut water (excellent natural source of rehydration) and Herbalife24 CR7 Drive for even more hydration benefits. 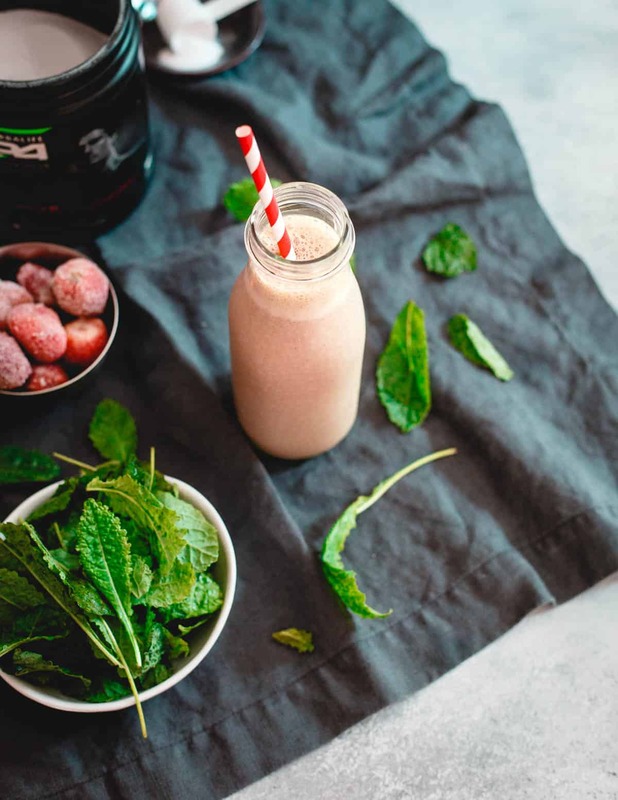 The result is the perfect concoction post-workout to get in not only the nutrition you need but the hydrating liquids and electrolytes to replenish what you depleted. 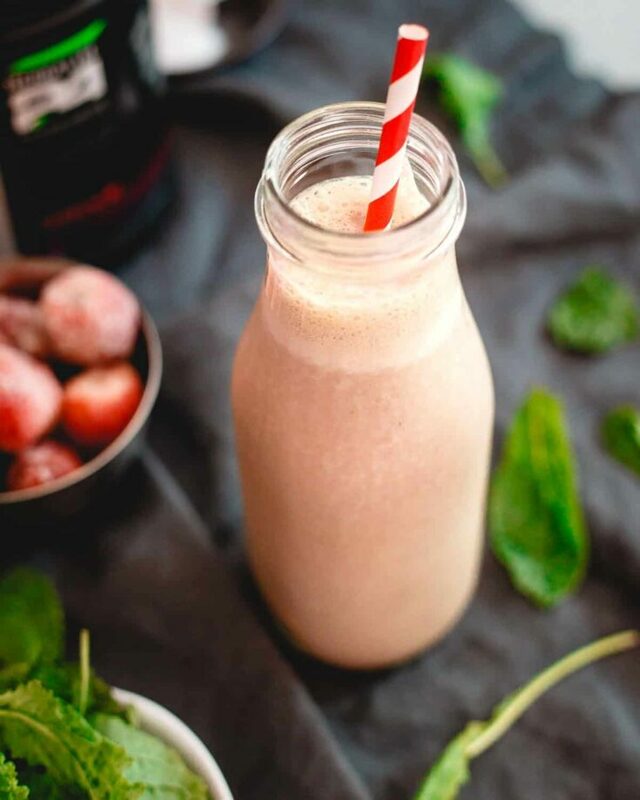 Check out how to make a healthy smoothie for more smoothie tips! Enjoyed these tips for hydration? Check out Eating Around Training and The Importance of Probiotics to Your Health + Creamy Kefir Honey Mustard Dressing. 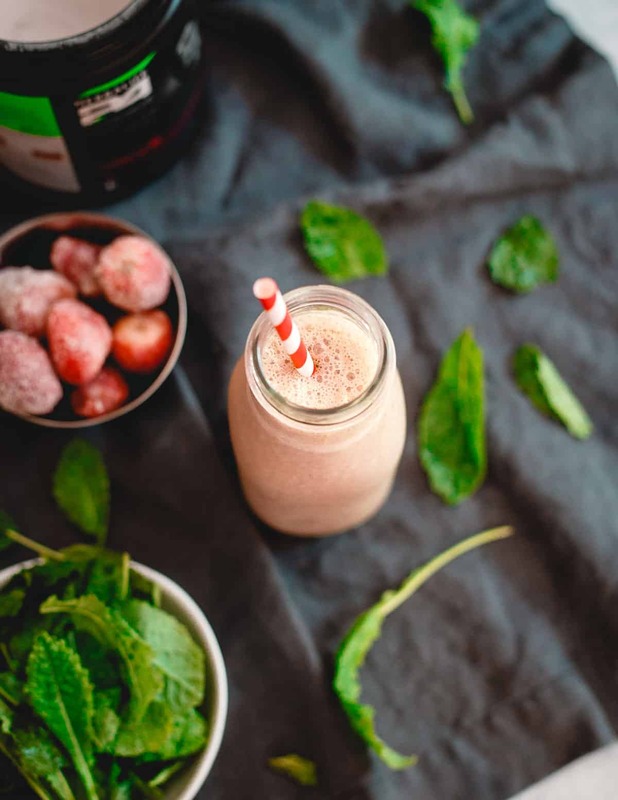 This hydrating berry green smoothie is a delicious way to recover after your workout with the perfectly balanced amount of protein and carbohydrates from super hydrating ingredients. Great article with some fantastic advice. Hydration is such an important topic – for anyone, but especially athletes who are so often losing water during and after a workout. These are wonderful tips to keep hydrated without downing glass after glass of water. Thanks so much for sharing your insight and recipe! I absolutely love this post — staying hydrated is so important but something I know I struggle with! I definitely have to add this to my smoothie arsenal! !